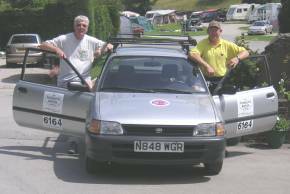 During December 2005 and January 2006, Nick Capron and Tim Lovatt took part in the Plymouth-Banjul Challenge, driving a 1996 Toyota Starlet from Cumbria to the Gambia. This page summarises their story, with full details on subsidiary pages as shown below. 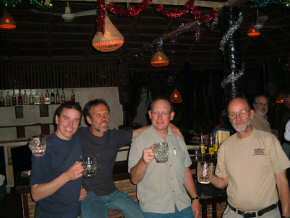 T4 Challenge 2007 was a preliminary expedition to reconnoitre the route for the first Bamako Run. Two Toyotas to Timbuktu 2008 (4Ts) Tim Lovatt and three friends drove two Toyota Landcruisers to Timbuktu. 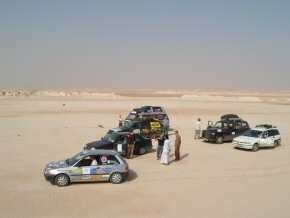 The Plymouth-Banjul Challenge started in 2003 as an ironic tribute to the Paris-Dakar Rally. Instead of highly expensive cars driven by world class rally drivers, with large back-up teams, this challenge consists of small teams on strictly limited budgets, and at the end of the challenge, the cars are auctioned for the benefit of local good causes. 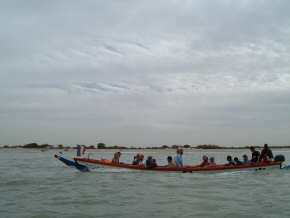 For further information, see the Plymouth-Banjul Challenge 2006 website. There are several teams taking part in this challenge, and also the Amsterdam-Dakar Challenge, who have decided to help Pageant in different ways. For more information on teams who took part in both challenges, see the Pageant 2005/6 Challenge Page. See also details of the route through France and Spain, across the Straits of Gibraltar, and then through Morocco, Western Sahara, Mauritania and Senegal to Banjul in The Gambia. Team Shap Ahoy consists of Nick Capron and Tim Lovatt. Nick is Primary Strategy Manager for Cumbria Education Service, and Tim is Manager of Park Cliffe Camping and Caravan Park, Windermere. They decided to use this Pageant page to record their progress on The Challenge, instead of setting up their own website. If you came here via an external link, please take time to look at the rest of our website, perhaps starting with the Pageant Home Page. 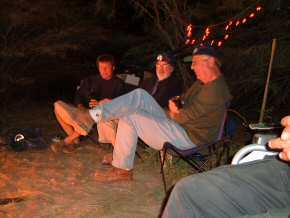 Nick and Tim organised fundraising events, such as a treasure hunt and a fireworks party. 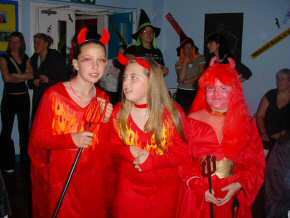 A number of Cumbrian Schools also helped with the fundraising: a fancy dress Halloween Disco at St Mary's RC Primary School in Kells near Whitehaven; a non uniform day at Shap CE Primary School; a 'Children in Need' day at St Gregory's and St Patrick's RC Infant School; a fundraising day as part of the bullying awareness campaign at Our Lady and St Patrick's RC School in Maryport and a non uniform day at Beckstone Primary School in Harrington, near Workington. There were also a large number of individual sponsors, and many local businesses helped with preparation of the car. Tim and Nick left Westmorland Services on the M6 at 9am on Saturday 17 December, and drove to Dover for the 4.30pm ferry to Boulogne, and continued as far as Beauvais for an overnight stop. On Sunday 18 December they drove from Beauvais to stay with Tim's friends Lisa and Richard, near Toulouse. On Monday 19 they continued to Murcia in Spain, and then on Tuesday 20 on to Sotogrande, near Gibraltar, taking in a visit to Granada on the way. They spent Wednesday 21 and Thursday 22 waiting for the bad weather to improve, so that they could take the ferry to Morocco, and indulged in a bit of sight-seeing at Ronda. 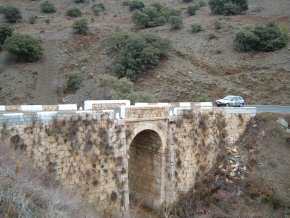 On Friday 23 December they finally crossed on the ferry from Tarifa to Tangier, and drove on to Casablanca. 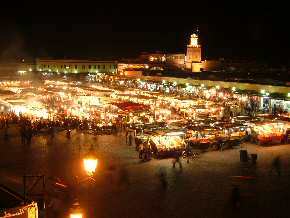 On Saturday 24 they drove on to to Marrakech, where they spent Christmas Day. On Monday 26 they continued from Marrakech through the Atlas Mountains across the Tizi n Test Pass to Tiznit. On Tuesday 27, they continued from from Tiznit to Laayoune in Western Sahara, with their first taste of driving through the desert. On Wednesday 28 December their journey took them through the desert, but quite close to the Atlantic Ocean, to the town of Dakhla. 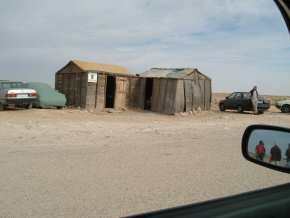 They then spent a day in Dakhla, and then on Friday 30, crossed the desert off-road to Nouadhibou in Mauritania. 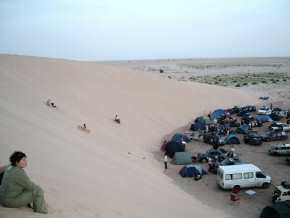 On Saturday 31 December they drove through the desert again from Nouadhibou to a campsite at the 'Big Dune', and from there, on New Year's Day, through the desert again to a campsite near Nouamghar. 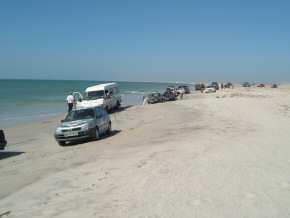 On Monday 2 January, the route continued from Nouamghar along the coast to a nice hotel in Nouakchott. 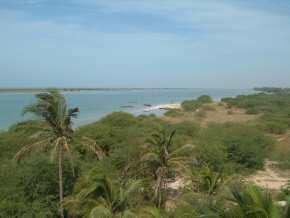 From there, on Tuesday, they continued further down the coast to a campsite at Zebrabar across the border in Senegal. Wednesday 4 January was a lazy day at Zebrabar campsite. On Thursday most of the members of the convoy took a boat trip across the bay to the old French colonial city of St Louis. 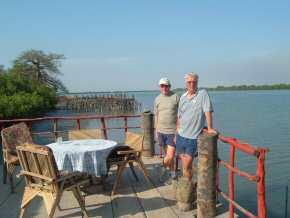 On Friday 6 January, they drove the last leg of the Challenge, from Zebrabar, over the border into The Gambia, and then across the Gambia River to Banjul, finally arriving at the Safari Gardens Hotel. 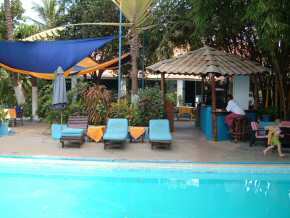 Both Saturday and Sunday 7 & 8 January were spent chilling out at the Safari Gardens Hotel in Banjul. On Monday 9, Pageant's agent Kemo arrived and took Nick and Tim on trip to Saloum Nursery School. 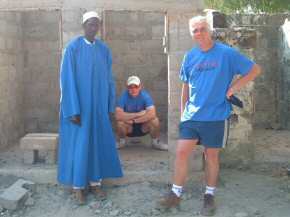 Shap Ahoy has raised over £5000 in sponsorship, and this has been donated to Saloum Nursery to fund a new toilet block. Nick and Tim were introduced to the pupils, and presented a giant cheque. 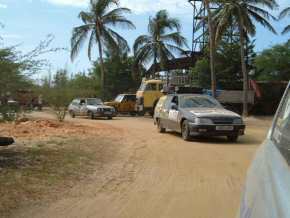 On Monday afternoon, there was a motorcade of the Group 1 cars through the streets of Banjul. 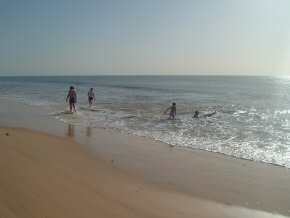 This was followed by a couple of days staying at the Bintang Bolong Lodge, with a visit to Tabaski village. They then returned to the Safari Garden Hotel, and flew home to the UK on 13 January. 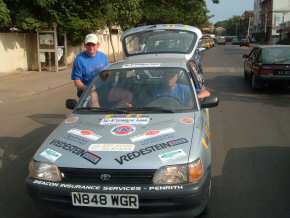 "Well it seems that our Plymouth to Banjul challenge was completed without any breakdowns (car-wise and relationship-wise). All credit to Bill and those men & women in Japan who screwed him together so well. It's amazing just how much punishment a car (and not just ours) can take. We should also like to thank the rest of our convoy who provided entertainment, company, morale, yellow cards, sand ladders and an unnatural will to push each other's cars through the desert." "Thanks must also go to our families who have encouraged us to go, put up with our preparations and our 4 week absence, and not least to the hundreds of sponsors who have helped with car parts, equipment, fuel, fundraising and a huge amount of cash for our nominated charity, over £5,000 at the time of writing this diary. On top of all this, our car, Bill, raised £1,692 at auction, not bad from an initial investment of £600 at home. The combined auction monies from all the vehicles will go to support 'grass roots' charities in the Gambia (see the official Plymouth Banjul Challenge website)." "What a cracking adventure it was. We would have no hesitation in recommending the challenge to anyone who is up for a bit of discomfort in lieu of a great experience. Many people have asked - 'would we do it again?' Yes we possibly would, but maybe something a bit different next time. Plans are at a very early stage (i.e. non existent), but the sound of Mercs through Mali to Ghana has a nice ring to it we think." "Watch this space - - - - Tim & Nick"
Tim and Nick have given us their final totals of money raised. 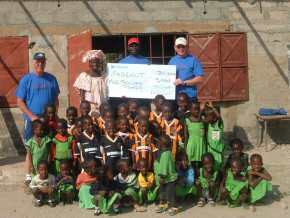 Pageant received the staggering total of £4572.55, which will be going to the Saloum Nursery. This is a truly fantastic amount, for which Pageant thanks Shap Ahoy. We are sure that Mariama at Saloum will be so pleased with her good fortune in having Shap Ahoy's support for her efforts. The sale of their Toyota raised 86,000 Dalasis, equivalent to £1692, which was then donated to ASSET and the GNOC in The Gambia.